We’ve suggested some tips and tricks for creating your own bridal make-up look, now head over to Bois de Jasmin for a comprehensive guide to choosing your ideal wedding fragrance. The beautiful post explicates just why choosing the right perfume will help you to remember your big day forever. 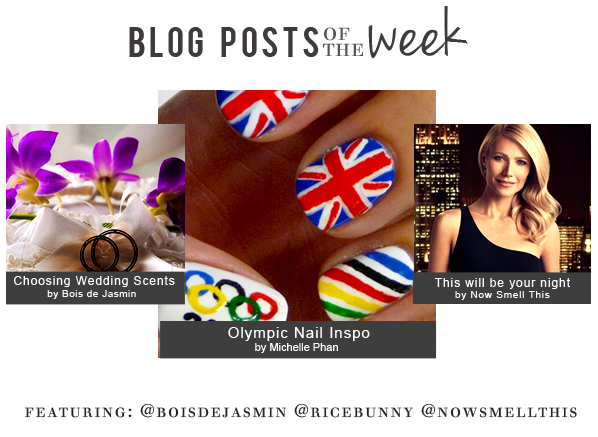 Olympics nail art is an unexpected trend – we’re seeing it everywhere! One of our favourite designs is this from Michelle Phan, a little nod to the host nation of the olympic games together with minature olympic rings. Robin of NST reveals the advert for the upcoming release from Hugo Boss ‘Boss Nuit, which is fronted by the ever-sophisticated Gwyneth Paltrow. With its slick visuals, epic soundtrack and sneaky peek of the bottle, the ad has made us even more excited for the launch of the voluptuous white floral. This entry was posted on Friday, August 3rd, 2012 at 10:00 am and is filed under Blog Posts of the Week, Fragrance. You can follow any responses to this entry through the RSS 2.0 feed. You can skip to the end and leave a response. Pinging is currently not allowed.